Hydrogen is a great medium for storing energy. It can be used as an alternative to batteries to store the excess energy from renewable energy systems like solar panels or wind turbines, and can be released from a tank to power a vehicle equipped with fuel cells. More than a decade ago, these prospects hyped the so called “hydrogen economy”. Governments and funding agencies drew up ambitious plans to develop cheaper fuel cells and to enable cars to store practicable quantities of hydrogen. In 2003, President George Bush committed $720 million to the research effort. But eventually… it all turned out to be a pipeline dream mostly because of two shortcomings: hydrogen is very expensive to store and make; from renewable sources at least. A novel research attempts to solve this latter issue underlying the hydrogen economy. Prof Song Jin of Most of University of Wisconsin-Madison says his team found an exiting new catalyst that can split water into hydrogen almost as well as platinum, the highly expensive noble metal used both in electrolysis devices and fuel cells. Man-made hydrogen is made through methane reforming, a process in which hot tubes heat the methane gas and steam in the presence of a catalyst to create pure hydrogen. This is the cheapest way to make hydrogen available today because you can make lots of it at a time. The disadvantage is that you have to burn a lot of energy and it’s all fossil fuel based. The other alternative is to split water molecules using electrolysis, with electricity sourced from renewable energy. To problem is that both fuel cells and electrolysis machines require expensive catalysts based on noble metals like palladium or platinum. “In the hydrogen evolution reaction, the whole game is coming up with inexpensive alternatives to platinum and the other noble metals,” says Song Jin, a professor of chemistry at the University of Wisconsin-Madison. Jin’s team was experimenting with iron pyrite and other inexpensive, abundant materials for energy transformation for quite a while. They struck gold when they eventually replaced the iron with cobalt. To the cobalt pyrite they added phosphorus resulting in a new material that’s been found to be highly effective as a catalyst. According to Jin, it’s the best non-noble metal catalyst and almost on par with platinum, but while platinum is traded with almost $1000 per ounce the cobalt catalyst is dirt cheap. 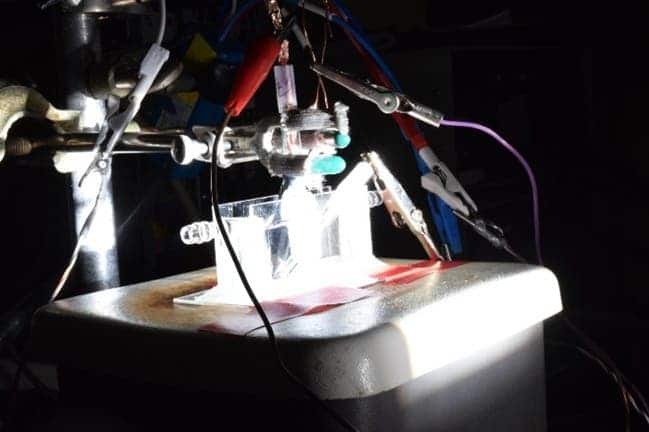 What’s more, the catalyst also works as a photocatalyst, meaning it can kick start a reaction using energy provided by the sun directly, as reported in Nature Materials. Of course, platinum electrolyzers are still the most efficient. For the same money, however, you could build more stacks based on the cobalt catalyst and effectively generate more hydrogen or energy for the same unit price. “One needs to consider the cost of the catalyst compared to the whole system. There’s always a tradeoff: If you want to build the best electrolyzer, you still want to use platinum. If you are able to sacrifice a bit of performance and are more concerned about the cost and scalability, you may use this new cobalt catalyst,” Jin says. The UWM researchers have already filed for a patent and if the findings can be transferred from the lab into the real world, it could prove quite exciting.